We’re looking for feedback on your class as we work on changes and adjustments for a future game update. While we may be making some specific class changes in 4.3, what we’re looking for in this thread is overall feeling on the class as a whole for more long term changes in the future. Concerns that your current damage, healing or tanking is not competitive. While this kind of feedback is often useful, it also is the kind of thing that can change from patch to patch, and so it isn’t as useful for long term vision changes. Concerns that your feedback is being ignored or that we don’t take these kind of posts seriously, or otherwise posting anything that is off-topic or not in the spirit of this thread’s intent. Requests for responses to your suggestions or feedback. The purpose of this thread is to get information to us, not the reverse. We hope you take these threads seriously, as we’re going to be reading them very carefully. We ask that you take time to think and formulate a useful and objective reply, as this feedback could be used to alter your class in substantial ways. We won’t be replying here addressing your concerns. This is purely for us to read your answers to the below questions. Please copy the below questions into your reply and answer each one. What are your biggest quality-of-life issues? For instance, no longer requiring ammo could be considered a quality-of-life improvement for hunters. What makes playing your class more fun? What makes playing your class less fun? What’s on your wish list for your class? What spells do you use the least? I believe if you can believe out of nothing an explosion (big bang) happened then how far fetched can god be? I would totally offer feedback if I didn't get permabanned for asking people what their favorite pancakes were..... and censoring myself. "Follow my heart, Follow my head, I'll follow anything to get to her heart." 12 hunters and 10 other classes being leveled. so on the wishlist, everyone should be saying "for volley to return"
Check out some arty stuff? OMG, I miss Eyes of the Beast! I used to love doing that.... even if it was just for fun most of the time. Adorable avatar by the very talented Lupisdarkmoon! Thanks! These posts are almost infuriating. **Bring back Volley!! Oh yeah, so we can't move and AoE at the same time? I loved when I tossed my volley only to have to move, or have the tank move them out of my Volley. That was fun. **Instant cast Cobra/Steady!! Wait, whaaaattt???? If we had all instant casts, I can't help but think that would be terribly, terribly OP. Same for people asking for Hawk/Fox to be combined. **I see a lot of people spewing outdated info; i.e. "I loved my hyena but all he has now is a slow!" No, he buffs bleed damage if I recall...? Still totally viable, especially as Marks. Top pet? No, but not useless. Stop wasting the dev's time with feedback about things that were already changed. **People who say they don't use abilities like Kill Command or Chimera. Well, duh, because you aren't the right spec. Don't think that's quite what they meant. **PvP hunters that don't use Eagle Eye. Hey, I see you're up there camping <base/flag>. Why not use your EE to see if <near by base/flag> is under attack? **Hunters who want a tree that removes the pet. You are now effectively cutting hunters like us here out of an entire tree. What if that tree proves top damage by a significant margin? Then the hunters who enjoy pets are shut out from raids. Seems like the good stuff is overshadowed by people who say they don't want to cast anything (S Priests shouldn't have to channel Mind Fly, Mages shouldn't have to cast Arcane Blast... I mean, let's get rid of all casting!) and people who want the dead zone removed. It doesn't need to be removed, we just need our melee ranged abilities buffed, maybe get a few new abilities there. I hope the devs who read this know better than to make weird changes like that. It wouldn't make sense to remove the minimum range for hunters, but it would be a very welcome change, at least for me. They could increase the range of kill command a few yards. In particular one of the things I mean by this is the player notion that restrictions=bad, and a certain inexorable pressure to remove them anywhere that they cause inconvenience. Cases in point - people saying cheetah / pack should lose the daze effect. Just... no. Should be needless to say, but we're a ranged class to begin with - having daze at least gives meleers (and mobs and stuff) some chance to catch up with us, and makes kiting still require a modicum of skill (and only just that, since they changed concussive shot from an energy costing 15 sec CD "use sparingly" ability to a free, 5 sec CD "perma-slow" ability). No dead zone? Again we are a ranged class not a melee class, and meleers should have some edge over us at close range? "Meaningful self heal"? Seriously? How bout we get a paladin bubble while we're at it. No. We aren't healers - mend pet is fine but for crying in a bucket we are defined (or should be) as much by what we are as by what we are not. Also... people don't use eagle eye? And think camo is "useless"? I use both frequently to save time on needless travel and combat - but who knows maybe I'm doing something wrong? If meleers should have an advantage over us, they need to do the same with every other ranged....aka Elemental Shamans, Warlocks, and Mages and Boomkins. They should have a dead zone too so melee has an up on them just as they do us. But it would just be easier to fix one class than fix all the other classes. A lot of people dont use eagle eye. I dont unless I'm in the molten front looking for rares. And Camo...overall..has been useless cause the only time its actually stealthing you is if you're stationary. Look at the buff if you don't believe me. when you move, you're not stealthed anymore. 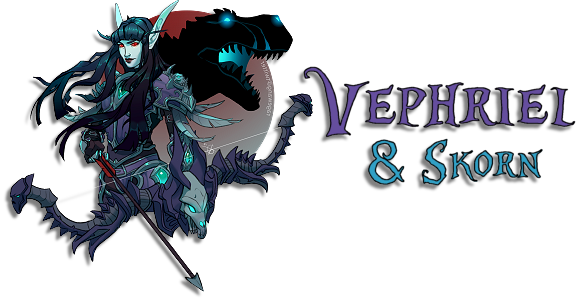 Sig Credits to Ashaine, Kamoodle, Sookie, Kurenio, Serenith, Ket Shi, Nili, Rongar, Britany, TheDoomcookie, Vyndara, and Vephriel! Avatar Credits to Samskeyti, Moonlost, Lupisdarkmoon, Nili, Britany, Kasstra, Seilahyn, and Vephriel! Except the other classes you described make more use of non-instant spells e.g. which can be interrupted or disrupted somewhat. Yes we have aimed shot but that spec also has a daze built into two of its primary attacks, so that just leaves steady / cobra which A) we can already use while moving and B) are for sustained ranged combat anyway not close tight spots. And as for camo - even when moving you still get "Untargetable by ranged attacks. Reducing the range at which enemy creatures will detect you", so it's great for the purpose I described. If it doesn't make you a rogue in PVP, well... it shouldn't. More than anything else, alot of this stuff really just highlights (more and more) the fact that it is simply not possible for the wow engine to 100% simultaneously accommodate both PVP and PVE. Not really. Arcane mages spam AB. Boomkins spam Moonfire. Warlocks? They got Hellfire. Those are instant. But ofc that's not their whole arsenal - just a small portion that's handy in a pinch (and hellfire damages the lock as well); none of those classes is designed to go toe to toe with a meleer for extended periods. Again though - this line of reasoning ultimately is going to arrive at the same destination, e.g. that PVE and PVP are not 100% compatible. There are going to be things that one side considers a "must have", and that the other side considers a "deal breaker". No but it's a lot of what they use though, especially in pvp. But I do feel Blizz needs to really revamp the pvp/pve thing and make them SEPARATE. Like PvE gets their buffs but when you enter a BG/RBG/Arena, the pvp nerfs and whatever go into play. Separation is really the only solution. Until they do that, both are going to (continue to) be eachother's ball and chain.